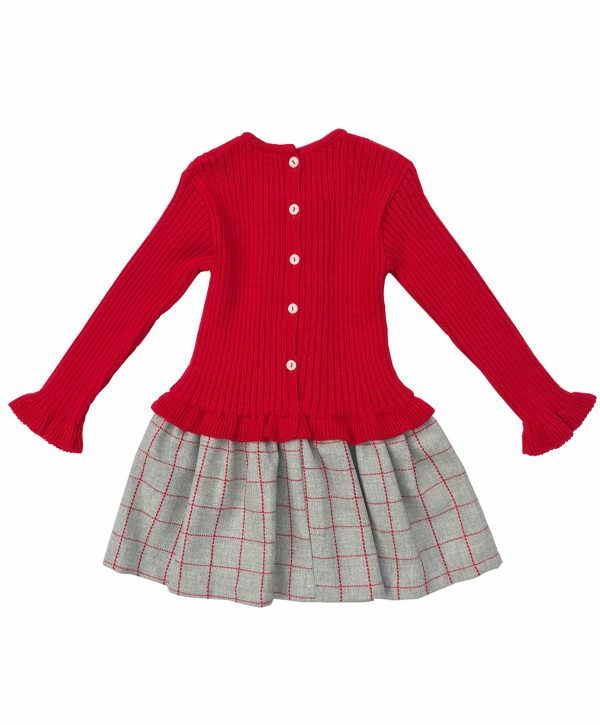 This beautiful wool mix dress will keep your little girl warm this winter. The comfortable ribbed top with frill detailing and full grey check skirt will ensure she looks pretty too. 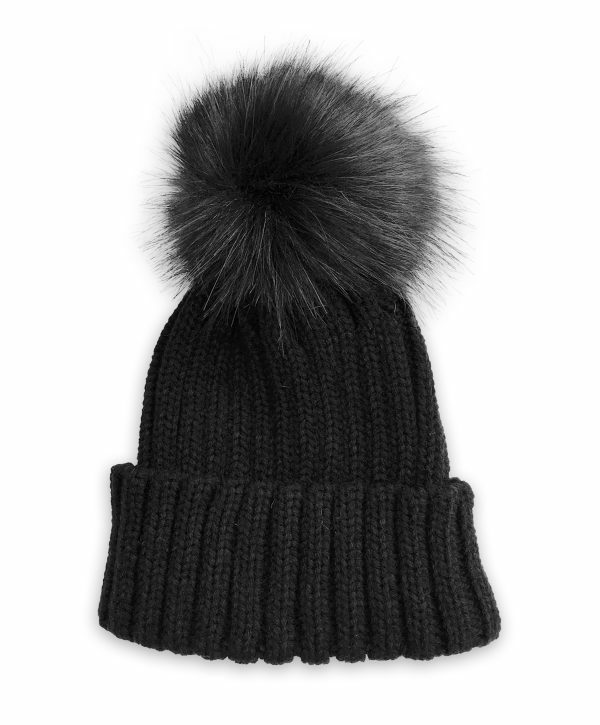 Grey ribbed tights, a chunky cardigan and maroon patent boots would look beautiful with this. Floral summer staples are so easy to wear, choose Sienna for any summer party or family get-together. Gorgeous details such as the crochet ribbon trim sleeves, gathered full skirt and sweet bow detail to the waist give this dress an extra pretty finish. 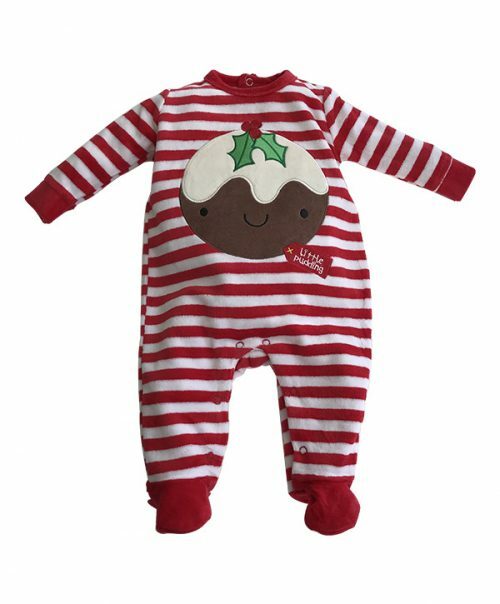 Your little one will need no encouragement putting this on. A beautiful yellow and blue printed summer dress. 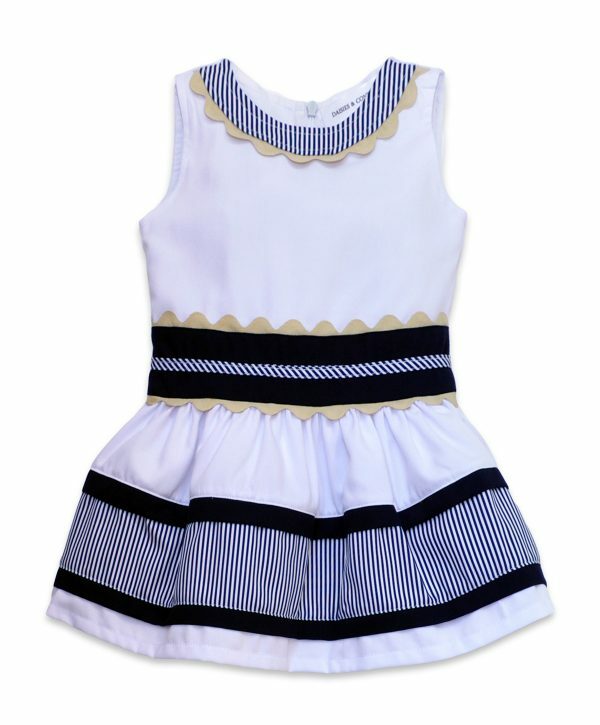 This dress has a round neck and pretty frilled capped sleeves that are trimmed with a lovely blue crochet ribbon. The dress is gathered at the waist for fullness and ¾ of the way down it is trimmed with a contrasting blue crochet ribbon. 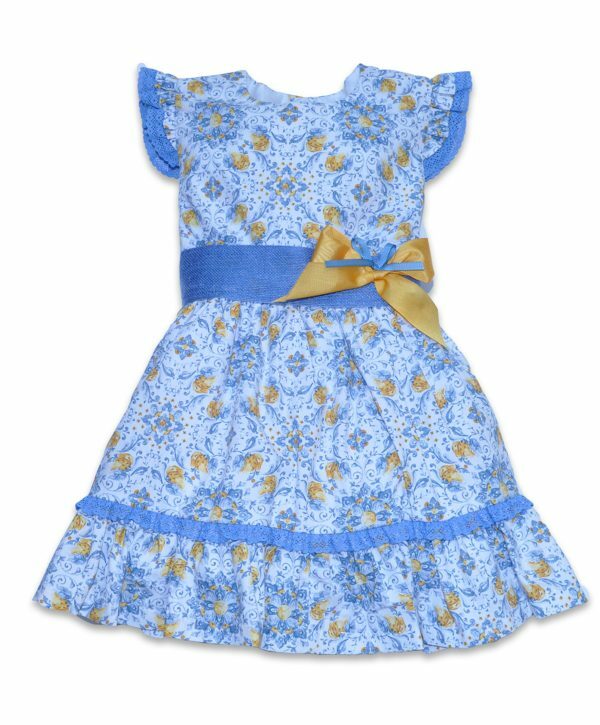 The front waist features a wide woven blue ribbon and is finished with a medium sized yellow and blue bow. The back of the dress fastens at the centre back with three white buttons and the wide woven blue ribbon ties into a large bow at the back. The dress is fully lined in white fabric with a full white tiered skirt for extra fullness. 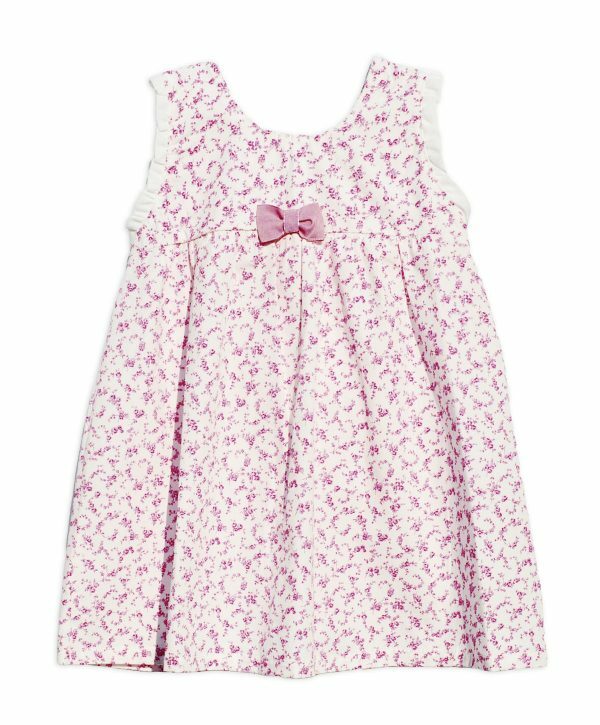 Looking for absolutely adorable, choose this pretty little dress with matching knickers. This style screams understated luxury. In textured dobby fabric with pretty scalloped crochet trims and a crisp satin ribbon bow on the front. Your little girl will look a million dollars. A lovely cream two piece set comprises of dress and matching knickers in a textured dobby fabric. The A-lined shaped dress is sleeveless with two crochet and satin ribbon trims that run from the neck to the hem. The hem is finished with a scalloped crochet detail. It fastens at the top of the back with two rows of clear buttons. The knickers are elasticated at the waist and leg openings for freedom of movement during wear. The composition is 50% Cotton 50% Polyester so it will not crease easily. 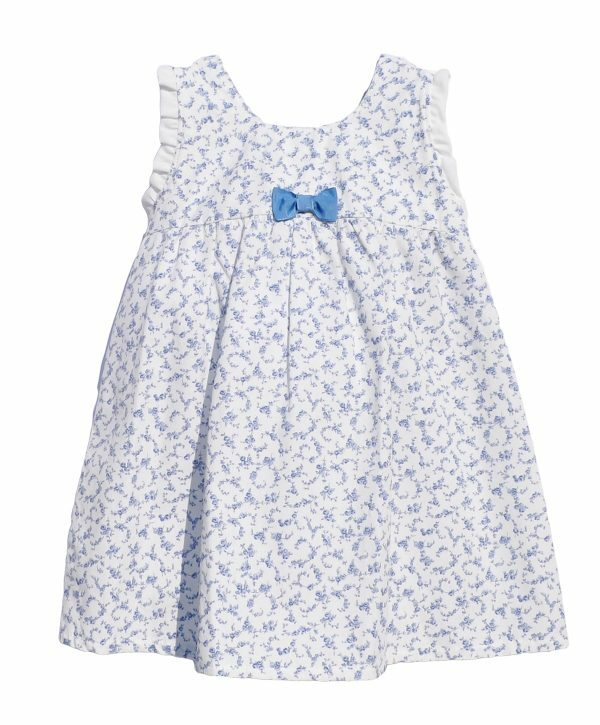 Looking for absolutely adorable, choose this pretty little dress with matching knickers. This style screams understated luxury. 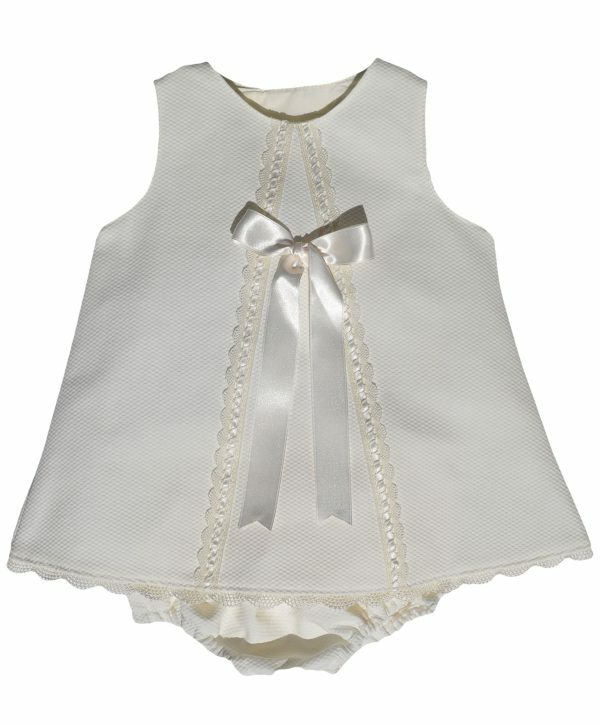 In textured dobby fabric with pretty scalloped crochet trims and a crisp satin ribbon bow on the front. Your little girl will look a million dollars. 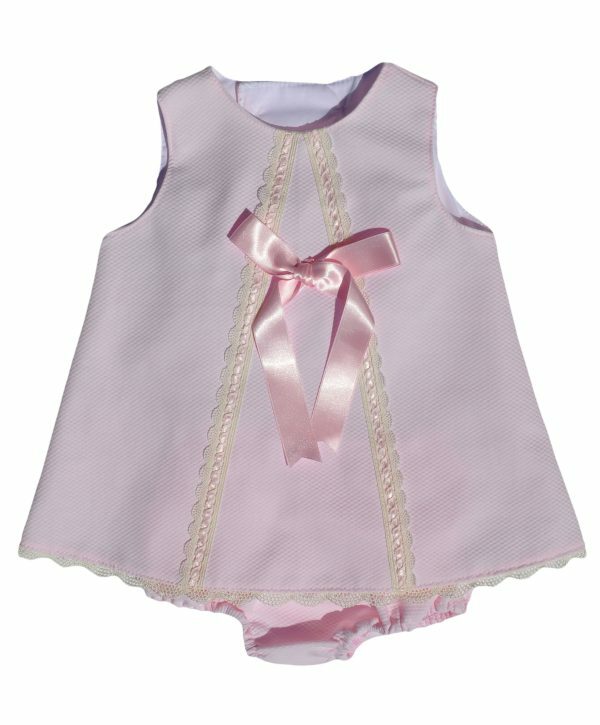 A lovely pink two piece set comprises of dress and matching knickers in a textured dobby fabric. The A-lined shaped dress is sleeveless with two crochet and satin ribbon trims that run from the neck to the hem. The hem is finished with a scalloped crochet detail. It fastens at the top of the back with two rows of clear buttons. The knickers are elasticated at the waist and leg openings for freedom of movement during wear. The composition is 50% Cotton 50% Polyester so it will not crease easily. 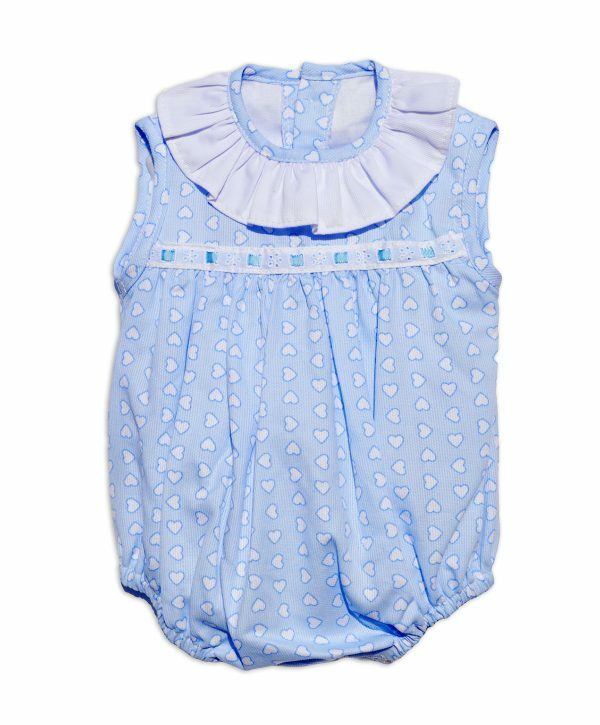 This lovely heart printed romper in 100% Cotton will keep your baby cool and comfortable on hot days, and provides you with easy access for nappy changes. The pretty suit is the perfect choice with lightweight cotton and a relaxed fit; it will be cool and airy while the cute all-in-one style ensures your baby looks stylish. The armholes and round neck are bound and the neck is finished with a white cotton frill. The front of the romper has gathered for fullness and is trimmed with a delicate ribbon. 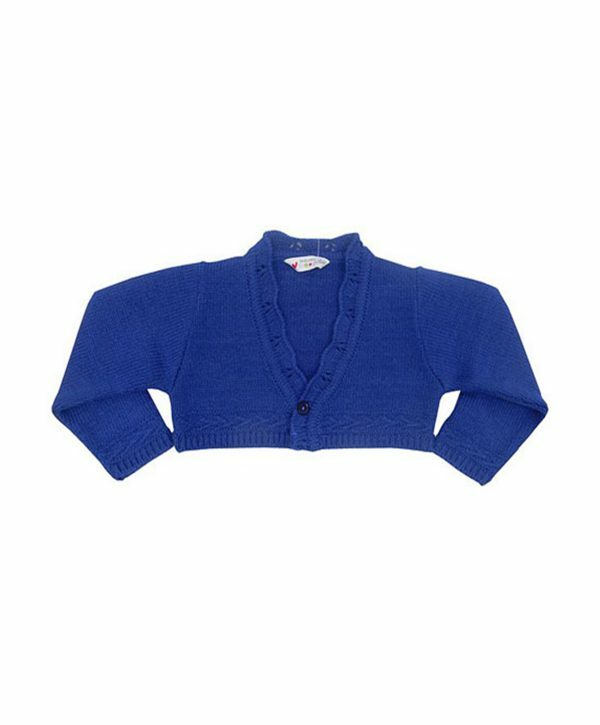 It fastens at the bottom with two buttons and at the rear with four buttons. The leg openings are elasticated for comfort during wear. Either side of the back placket is two inverted pleats that run from the shoulder down to the leg openings. 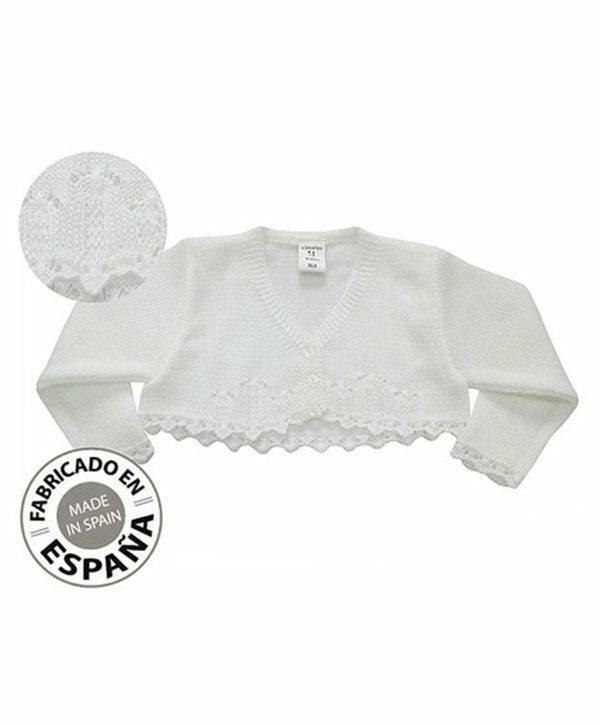 Internally the top is lined with white cotton fabric for comfort against the child’s skin. 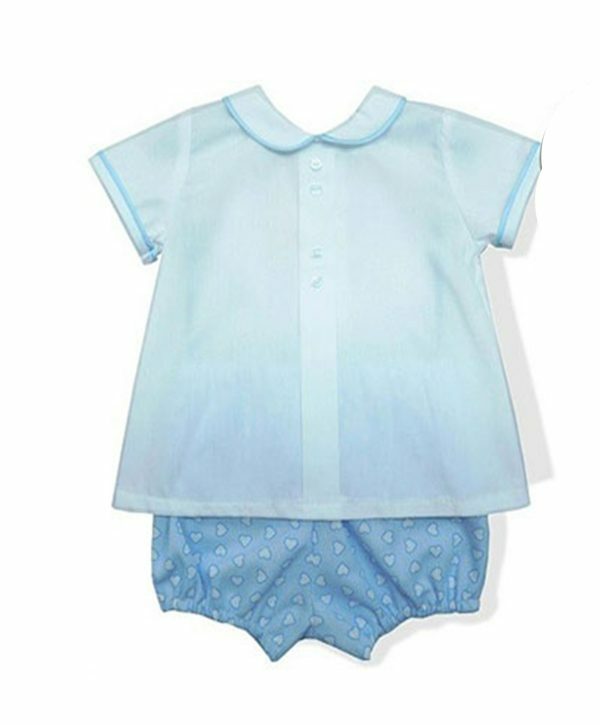 This lovely unisex peter pan collar shirt and knicker set is adorable. The lightweight classic woven shirt and matching heart printed knickers in sky blue is easily dressed up or down, making it truly versatile. It’s easy to team with jeans or a skirt for alternative casual looks or with a smart cardigan, socks and smart shoes for a special occasion. Your little one is guaranteed to look gorgeous. 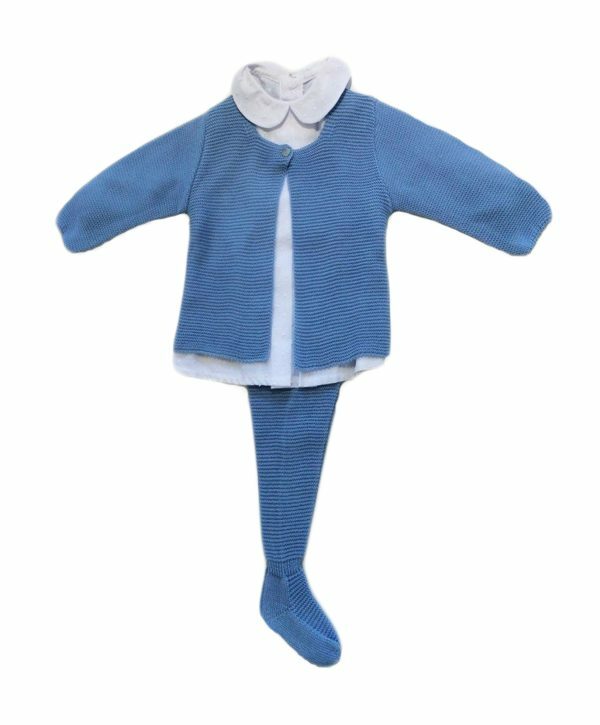 The shirt has short sleeves and a peter pan collar which is trimmed with sky blue piping. The sleeves are gathered into bound and piped cuffs for a very subtle puffed fit. The center front features a box pleat with two buttons at the neck and the shirt fastens at the back with three white buttons. The cotton shorts are printed with a cute love heart pattern and are elasticated at the waist and leg openings for a comfortable fit.